Nerd check: Adi Gallia was a Jedi, her blade was blue, not red. Mundi's blade was blue, not purple. 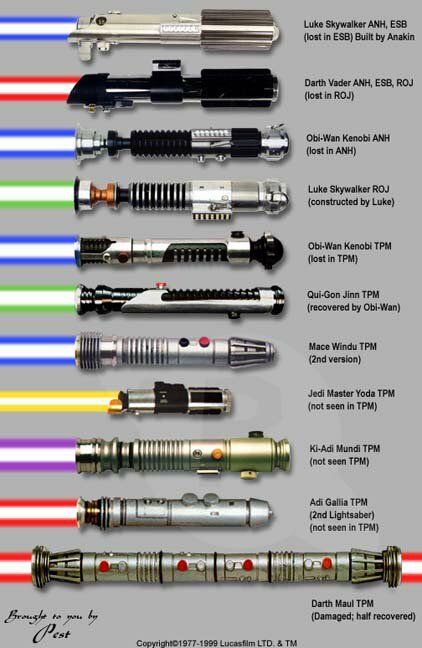 Kenobi's light saber was recovered in TPM and seen again in AOTC. While Adi Gallia was a Jedi she actually wielded three different colored lightsabers at various points. The first being green, the third blue, but the middle one, you guessed it, red. Ki-Adi Mundi's lightsaber had a purple blade while he was a Knight. He later changed it to blue when he became a master. Windu's blade was originally blue, but changed to purple at the request of Sam Jackson. Kenobi's lightsaber was lost in TPM. He made another identical one for AOTC. Yoda's lightsaber was definitely green though.